If you're facing trust issues in your relationship you're not alone. Most of us are never taught how to be trustworthy (I mean more than being honest) or to repair trust with others. So almost every relationship has a few trust issues. So today I wanted to share one of my favorite teachings on trust and a few tools to build trust in your own relationship. Brene Brown has been researching resilience in strong relationships for a long time, and in this video, she gives the main ingredients to cook up of trust in any partnership. She makes her research findings super easy to understand and apply to your daily life with all her vibrant examples and stories. Check it out below. Then read on for reflection to share with your partner. Notice the ways each of you may push on or pressure the other when they set a boundary. Notice how you might pressure or push yourself to override your boundaries. Reliability - I do what I say I will do, and you do too. Notice the ways you fail to follow through on promises. How could you do a better job walking your talk with your partner and with yourself? Are there promises you still need to follow through on? How can you hold yourself accountable for meeting them? Are there some you can no longer meet? How can you take responsibility for letting your partner down with those and be more aware (not to overpromise) in the future? Accountability - I can own, apologize for, and remedy the hurts I cause, and I know you will do the same. Are there apologies you're still waiting for in your relationship? Can you imagine the ones your partner might be waiting for? Make a list and develop suggestions for how you'll handle each situation differently in the future. Share it with your sweetie. Vault - I trust you will hold what I say in confidence, and we each do this for others as well. Think about the privacy boundaries you have between you. Are there things you expect neither of you will share with others? Think about the stories, traumas, reactions, and mistakes you've shared. Is there anything you want to be kept just between you two? How can you clearly state those boundaries so your partner can be sure they're a solid vault? Integrity - I know we will both act with integrity, doing what is right instead of what is easy. Think back over your time together. How and when has each of you taken the high road? Take a moment to recognize the ways you've each acted with integrity in the time you've known each other. Then ask, how can I support you in doing what's right instead of what's easy moving forward? What does meaningful support look like in this partnership? Non-Judgment - I can fall apart, ask for help, and struggle without worrying about losing you (and you can with me too). This one is a hard one- and it is so important. Relationships with space for mistake-making and repair last longer than those without. Take time to think about the times you've really shown up for one another in times of struggle. What does meaningful support look like to each of you in those moments? How do you know when each other in struggling? How do you know your sweetheart is really there for you? How do you want to be supported in future struggles? Generosity - My default assumption is that you have the best intentions at heart- even when things get sticky. Finally, this is the core of trust. Can I give you the benefit of the doubt in moments of hardship? How can I work to believe you would never hurt me? How can I better communicate with my actions that I would never intend to hurt you? If you get stuck talking through these with a partner give me a call, I'd love to help you. Two of my favorite writers and relationship experts (Dan Savage and Esther Perel) have done a lot of shared interviews and I wanted to share the best of them with you. In the very first couple minutes Dan outlines some of the most common reasons people cheat in relationships. Then Esther clarifies the difference between infidelity and non-monogamy. If you listen to nothing else, check in at minute 11:21. Esther breaks down one of the most important issues in desire for long-term relationships. She outlines the issue with being the "chosen one" for your partner and how it diminishes desire when we're together a long time. When asked how she would re-design marriage (at 15:28). She posits that marriage isn't necessary in the same way as it once way. This history of marriage and committed relationships is missing in most people's understanding of partnership. Later she dives into the critical balance between stability and novelty in long-term relationships (near 18:00). "Too much novelty and not enough stability is chaos and too much stability without novelty becomes fossilized." She says there is not enough fluidity in marriage- and I wholeheartedly agree. Finally, early on in the interview Dan discusses the difference between default monogamy and intentional monogamy- the cornerstone of my work with couples considering opening their relationships. Check out the full interview below and call me for a free consultation if you'd like to discuss these topics in your own partnership. I lead couples retreats, host workshops, and coach clients online (and in Portland, OR). Choosing to turn to a stranger in a time of pain is really a courageous act. Often it's difficult to imagine what talking to a professional might feel like. This recording is a really powerful session from my mentor, Esther Perel, helping a couple work on coming together after an affair. It's a pretty intense listen, but if you're curious about talking with a helping professional yourself, or if you're struggling to come together after infidelity this recording may be helpful to you. If you'd like to schedule a consultation to talk about working with me click here. 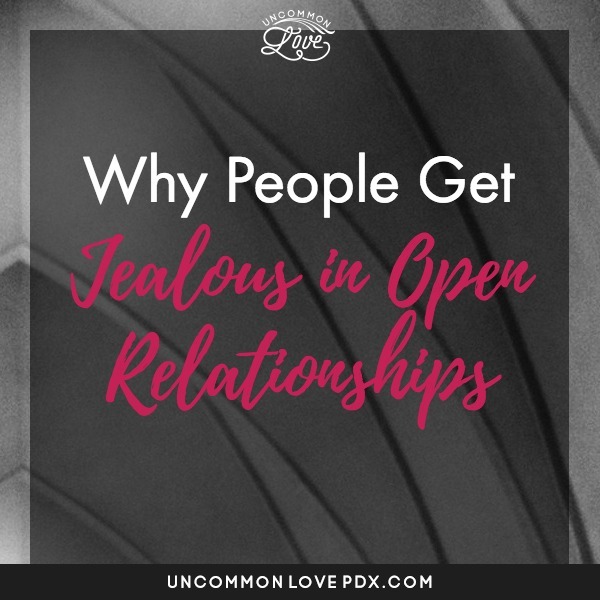 In ten years working with jealousy in relationships I've seen a lot of folks through the shadowy sides of envy, insecurity, and fear. No two experiences look the same, and yet there are a lot of clear themes. What is my jealousy trying to teach me? What does my jealousy want to know? What does jealousy want to know? What would bring me security or reassurance in this moment? What does meaningful support look like in this moment? What other emotions travel alongside my jealousy? (anxiety, fear, envy, admiration, lonliness, grief, and anger are common buddies of jealousy) What do each of them want from this situation? If my jealousy wasn't present how would I be different? What is my jealousy hoping for? If you'd like help sitting with jealousy and insecurity to learn from it please give me a call. I'm always here to help. Y'all know I'm a HUGE Brene' Brown fan. Here's a helpful graphic for you all about identifying the elements of trust in your partnership. If you want help building (or rebuilding) trust give me a call, I'm here for you! This is one of the best explanations of trust I have EVER seen. It is worth the twenty minutes to sit and watch and then talk it through with someone you love. Brene Brown has been researching resilience in courageous individuals and strong relationships for many years now, and in this talk she outlines the key ingredients of trust in relationships. With plenty of juicy stories and examples she makes her research findings super easy to understand and apply to your daily life. I'll including some reflection questions to guide your post-video self-work (journaling) and couples work (shared reflection) below. Let me know if you'd like to talk through trust building with me 1:1 (schedule a free call right here). How can I better honor my own boundaries? Where can I practice better reliability in my agreements with myself? Are there any unresolved inner conflicts I need to forgive myself for? How can I work to resolve those? Where can I be more discerning about sharing tender parts of myself with others? How would things be different for me if I did what was right instead of what was easy? How can I be more gentle with myself when I need help from others? How can I care for myself (like a good friend would) when I make mistakes? How would my life be different if I cultivated greater self-compassion? How could we be more clear about our expectations with each other? What does meaningful support look like in this partnership? Are there any unresolved conflicts between us I need to apologize for? How can I work to own and resolve those? How can we support each other in doing what is right instead of what is easy? How can we be more tender with each other when we make mistakes?